I was really pleased with the way this cake turned out. It was reminiscent of revani because of the syrup that’s poured over the cooked cake at the end: it seems like a lot but amazingly the cake comfortably absorbs it all. 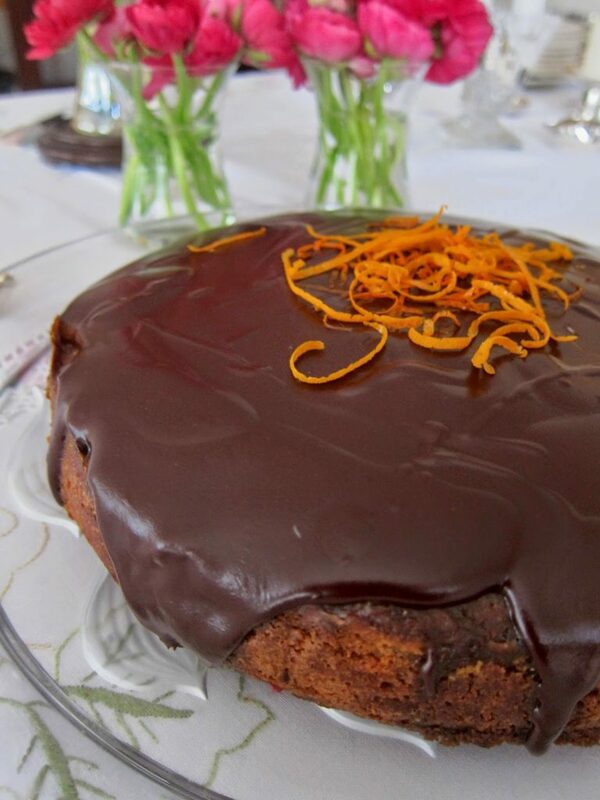 orange & almond syrup cake with chocolate icing – an optional extra! The recipe states: Serves 8-10 but it could serve more. It cuts like a dream. The consistency is excellent so cutting slim slices of orange-imbued-with-a- hint-of-marzipane cake is easy. I repeat: I was very chuffed with this cake. Looks great, doesn’t it? Sophisticated and elegant. I don’t know how I chanced upon this recipe as I certainly wasn’t in quest of a dessert-type one. But there I was, with Ottolenghi’s Jerusalem open on my lap and somehow this page fell open. It looked mouth-watering but apart from that, I saw I could make it in advance and freeze it. A great advantage from my point of view as we were planning a family party for the following weekend. So that’s exactly what I did: made it a week in advance, double wrapped it in foil and froze it. Worked a treat! 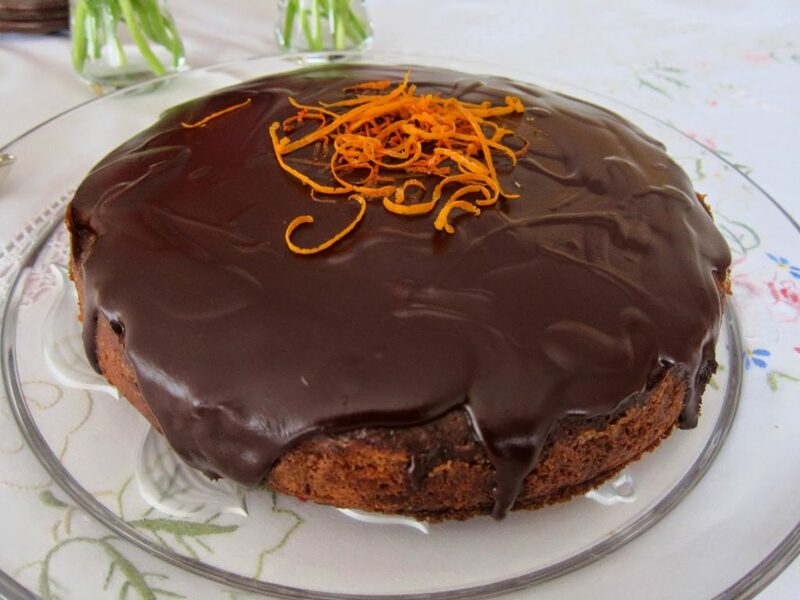 I could have served it just like that with the strips of orange zest scattered over the top because it was glistening and moist but I took the option of adding the chocolate/honey icing with added spot of cognac. I think it was definitely worth it both taste wise and looks wise. To die for! 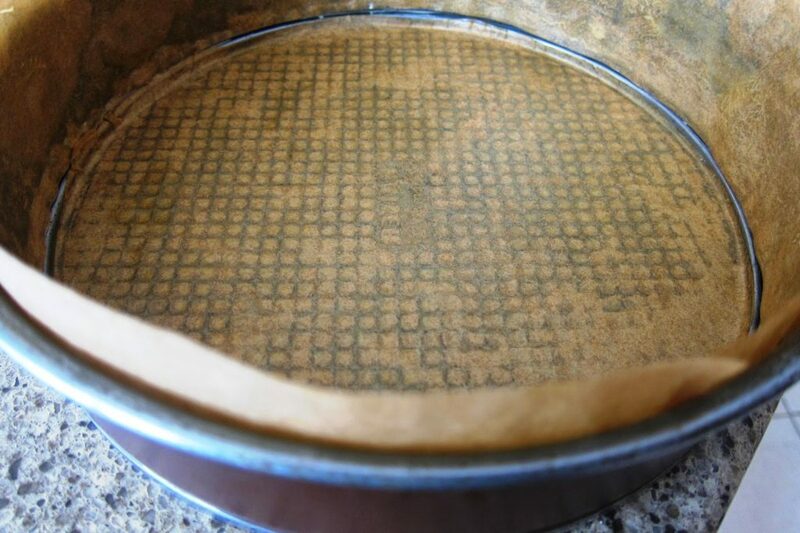 Lightly grease a 24cm spring-form tin and line the sides and base with baking parchment. Place the butter, 300g of the sugar and both zests in a mixer bowl and use a beater attachment to combine everything well on a slow speed. Do not work the mix too much or incorporate much air. Add half the amount of ground almonds and continue mixing to fold through. Add the eggs gradually, as the machine is running, scraping the bottom and sides of the bowl a couple of times as you go. 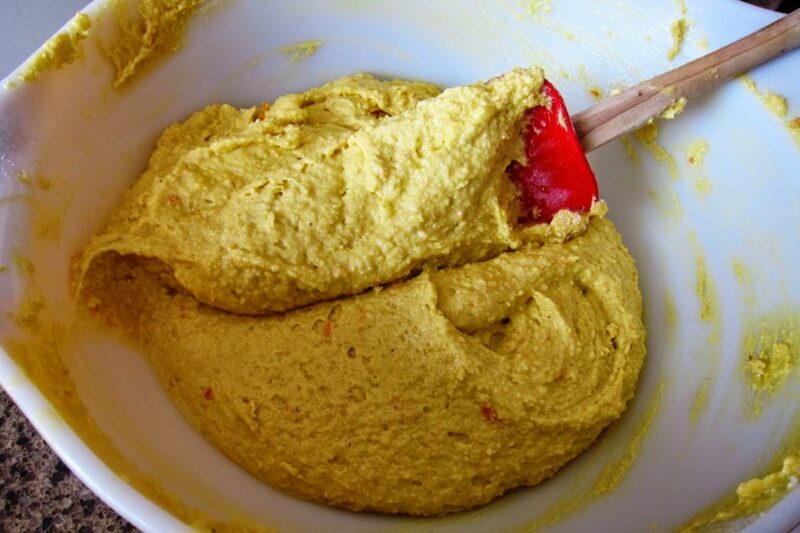 Add the remaining ground almonds, flour and salt and work them until the mix is completely smooth. Spread the cake batter inside the cake tin and level it out with a galette knife. Place the cake in the oven and bake for 50-60 minutes. Check that it’s ready by inserting a skewer inside. It should come out a little bit moist. When the cake is almost cooked through, place the remaining sugar and citrus juices in a small saucepan and bring to the boil (the juices should add up to approximately 120ml – remove some if needed). when it comes to the boil, remove the syrup from the heat. 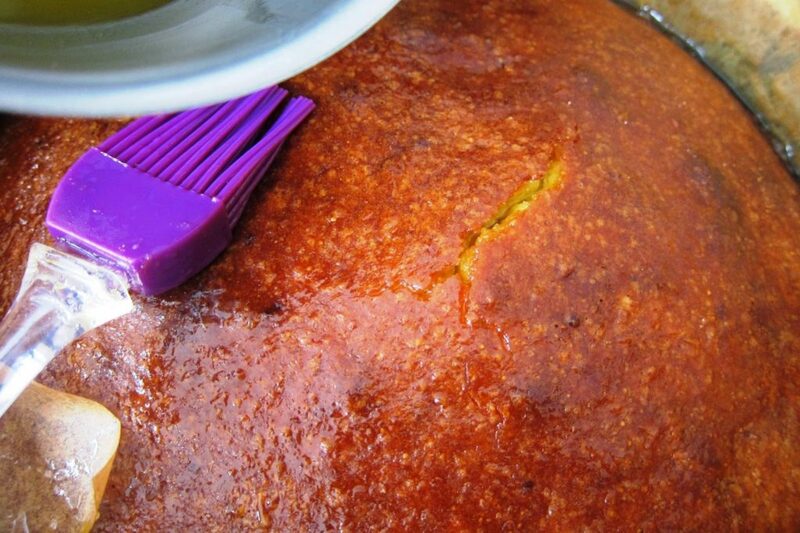 As soon as the cake comes out of the oven, brush it with the boiling syrup, making sure all the syrup is soaked through. Leave the cake to cool down completely in the tin before you remove it. You can then serve it as it is, garnished with orange strips, or store it for up to three days in an airtight container. If you wish to ice the cake, we recommend doing this on the day you want to serve it so the icing is fresh and shiny. Put the butter, chocolate and honey in a heatproof bowl and place over a saucepan of simmering water, making sure the bowl does not touch the water.Stir until everything is melted, remove from the heat immediately and fold in the cognac. Pour the icing over the cool cake, allowing it to dribble naturally around the sides without covering the cake completely. 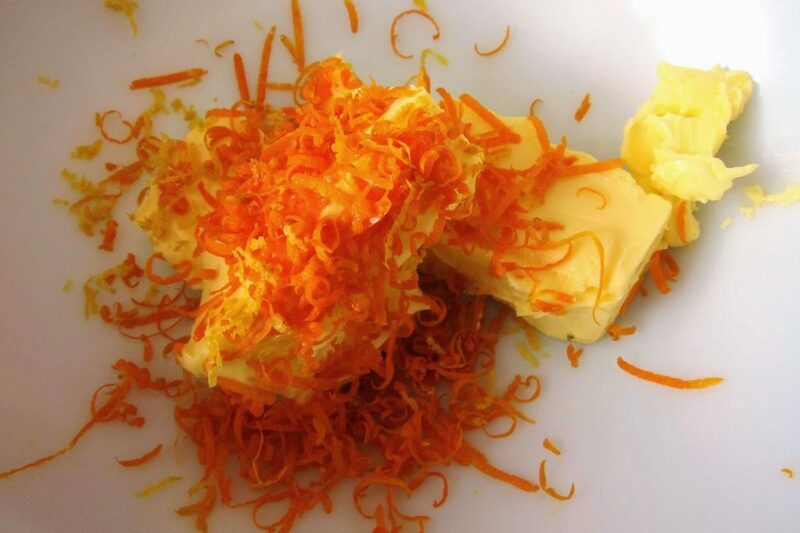 Let the icing set and then garnish with strips of orange zest at the centre of the cake. I actually made this cake the same day as I made the Orange Kiss-me-Cake but ne’er were two orange-based cakes more different. The first is definitely a no-nonsense yet delicious teacake; this one is much more sophisticated, not for children but definitely an adult crowd-pleaser. 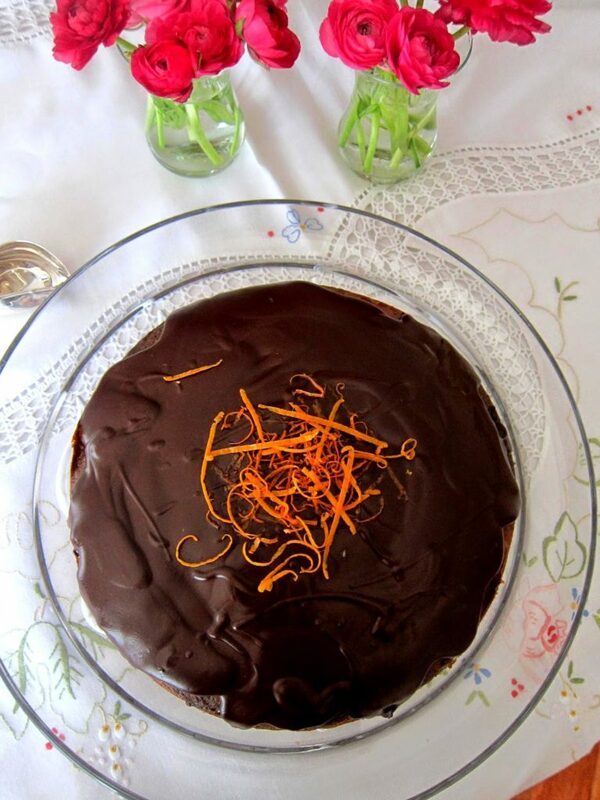 Previous Post: « Orange Kiss-Me-Cake: A Recipe from My Past! Thanks for sharing the recipe – everyone seems to rave about how great this cake is, so I’d like to try it for Christmas. 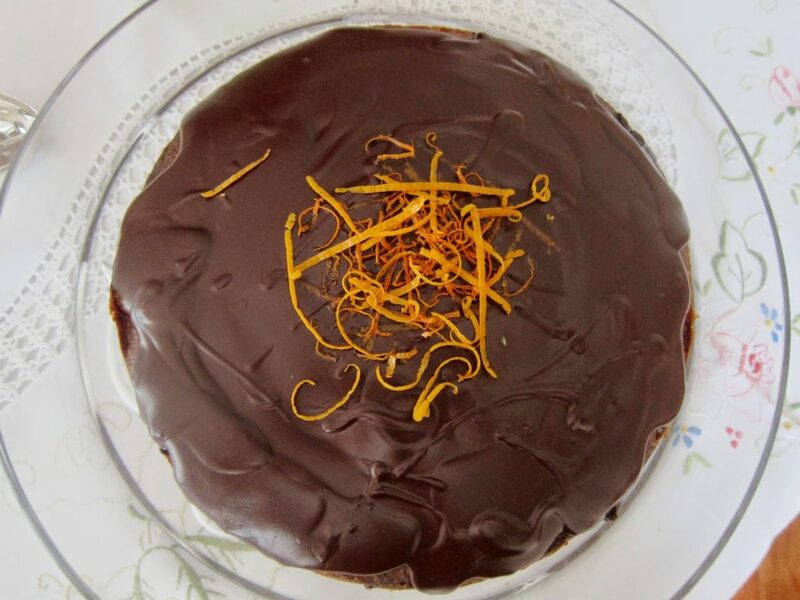 I’d prefer to get ahead and make it this weekend, so just a question about the freezing: did you make the chocolate topping fresh, once the cake had thawed, or did you freeze the cake with the chocolate topping on it? Hi there, I am so sorry that your message got lost in the system. I found it quite by accident today. Ottolenghi’s advice is ro make the amazing choc icing the morning it’s going to be served. It makes a difference as it will be nice and shiny. Otherwise it loses its lustre and goes dull. So I wld freeze the cake without icing.